The main difference between HDL and Software Language is that HDL describes the behavior of digital systems while Software Language provides a set of instructions for the CPU to perform a specific task. A digital circuit is a circuit that operates within two discrete levels (true, false). HDL language helps to describe the functionalities of digital systems. On the other hand, a software language helps to write programs for various applications such as web, mobile, enterprise applications, etc. HDL stands for Hardware Description Language. HDL is used to describe the behavior of digital circuits. HDL languages consist of programming structures such as expressions, statements, control structures, etc. These languages form an integral part of electronic design automation systems such as complex circuits, microprocessors, and, programmable logic devices. The most common HDL languages are Verilog and VHDL. Verilog – This language is similar to C. The latest version of Verilog is IEEE 1364 – 2005. It is a case sensitive language that allows real-time simulations. The basic building block of the language is called a module. VHDL – Base languages for this language are Ada and Pascal. It is not case sensitive. A hardware module in VHDL is called an entity. Usually, VHDL is complex than Verilog. Software language helps to develop daily software applications. There are two types of software languages as high level and low-level languages. High-level languages follow a syntax similar to English. It is easier for the programmers to read, understand and write them. 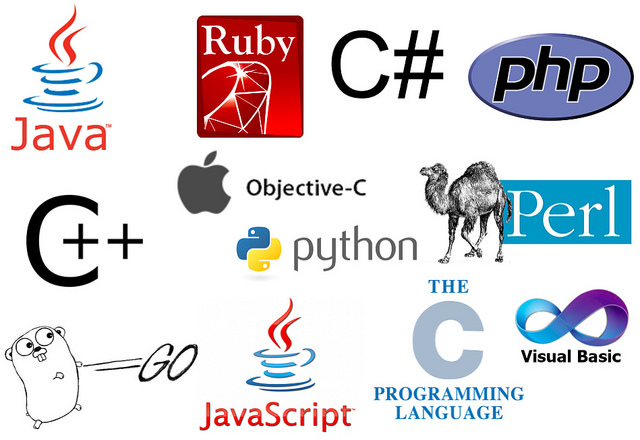 Java, C, C++, Python, PHP, Perl, and Ruby are some examples for high-level languages. We can convert these programs into machine language using a compiler or an interpreter. Finally, the CPU can directly execute the machine codes to perform the defined task. The applications we can build using these languages are as follows. C, C++ – Operating systems, drivers, databases, language utilities, etc. Python – Machine learning applications, developing algorithms, web development, etc. Java – Standalone applications, web applications, mobile applications, etc. The low-level languages are one step below the high-level languages, but one step above machine language. These languages are closer to hardware level than high-level languages. Assembly is a low-level programing language. We can use Assembly to write applications such as operating systems. 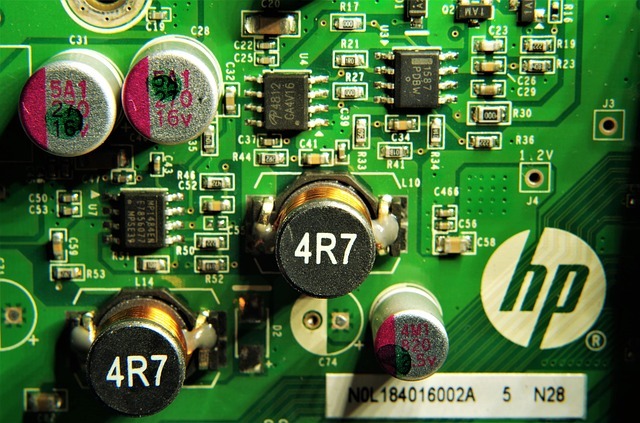 HDL is a specialized computer language used to describe the structure and behavior of electronic circuits, most commonly, digital logic circuits. Software Language, on the other hand, is a computer language used to write a set of instructions to allow the CPU to perform a specific task. 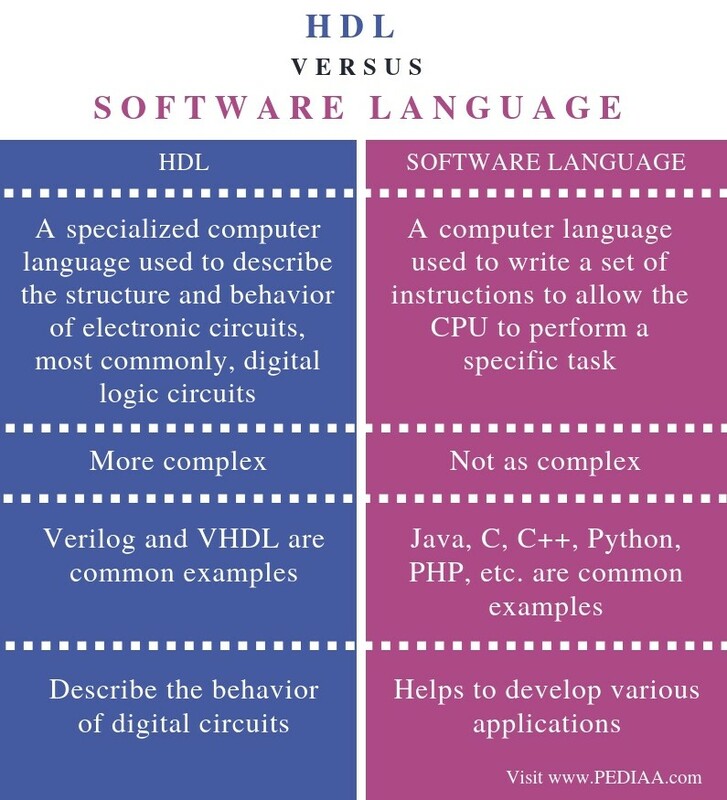 This is the main difference between HDL and Software Language. Complexity is another difference between HDL and Software Language. HDL is more complex than a software language. Verilog and VHDL are common HDL while Java, C, C++, Python, PHP etc. are common software language. The main use of HDL is to describe the behavior of digital circuits. Software language helps to develop various applications. A programmer can select a language depending on the application. This is another difference between HDL and Software Language. HDL and Software language are programming languages, but they have different uses. The main difference between HDL and Software Language is that HDL is used to describe the behavior of digital systems while Software Language is used to provide a set of instructions for the CPU to perform a specific task. 1. “Hardware Description Language.” Wikipedia, Wikimedia Foundation, 8 Jan. 2019, Available here.